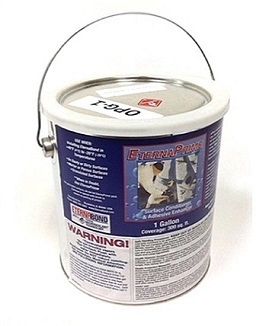 PRODUCT: EternaPrime Primer, One Gallon Can. Price/Can. (Flammable: Ground shipment only). DESCRIPTION: EternaPrime® is an adhesive and surface conditioner intended to aid adhesion of EternaBond® MicroSealant tapes, or other non- MicroSealant tapes such as butyl tapes and other self adhesive seaming tapes. EternaPrime® is also an excellent primer for use with self-adhered modified bitumen membranes. Use EternaPrime® when surfaces to be bonded are very dirty (oxidized and cannot be easily cleaned), or dusty (like on a tar and gravel roof). EternaPrime® will prepare the surface by coalescing all loose particles into a solid platform for the EternaBond® tape to adhere to. EternaPrime® allows EternaBond® MicroSealant tapes to be installed in temperatures as low as -20°F (-29°C). EternaPrime® also prepares most contaminated surfaces for tape application. Product is clear/light amber. It will darken where sun exposed. Apply thin, do not puddle. Not for use on PVC roofing. COVERAGE: One quart will cover about 75 sq. ft., depending on surface texture. Mix VERY WELL before using. For cold weather installation if the RoofSeal or Doublestick installation temperature will be between -20F and +40F degrees. When surfaces to be bonded are dirty (oxidized and cannot be well cleaned). Excellent for use when repairing self-adhered modified bitumen membranes. On mortar or porous surfaces, granulated, or slightly dusty (like on a tar and gravel roof). Where enhanced surface adhesion is required. Do not use EternaPrime on PVC roofs as reactivation of plasticizers may occur.